Club Penguin Cheats by Mimo777 Club Penguin Cheats by Mimo777: Club Penguin Field Ops Return Tomorrow! Gary has sent us yet another Club Penguin message update on Field Ops! Hmmm, training operation. What do you think that could include? I think that remember they had the stealth agents etc. I think you might choose which one you want to be and then you have to go through training to be the agent you want to be. Hurrah! I am so glad field ops will return! That sounds cool! I think class lead means that penguins who have all items in one or two classes is class leader! Thats good because i have all of the stealth and comm gear! Mimo, I think this means that there will be different feild ops for people that have different gear. For example people that have stealth gear would go on stealth feild ops. Mabe even the non members would get new missions. HAHAHAHA you people are all lonely washed up losers who have nothing better to do with your lives than play on coup penguin, and cheat! You people should really get lives, hang out wi your friends, get a date, do something you nerds! 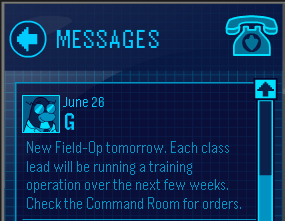 I think this means that the leaders for each class (which are; tech:Gary, comm:Rookie, tactical:jet pack guy, stealth:dot, and basic:the director) will give us a field op and each one will have a week and the next week will be a different class. I also think you don't need the gear to do the field ops so everyone can do them.